It is probably every photographer’s dream to have a portable computer with them when out on a shoot. Carrying a laptop may not always be practical – especially when one is already burdened with a ton of gear. 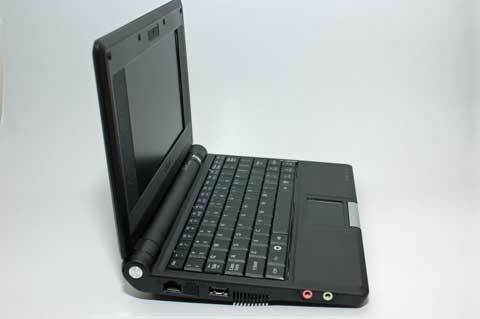 Enter the ASUS Eee PC – a sub-1kg / 2 lb ultra-portable from the Taiwanese manufacturer that boasts a 7” screen, compact form factor and reasonable battery life. Another drawcard of the ASUS Eee is its price. At around $499 AUD / $399 USD (RRP), it won’t break the bank and is within reach of most consumers. Should the ASUS Eee be part of every photographer’s toolkit? Find out in this review. I will go into the reasons within the relevant sections in the review. 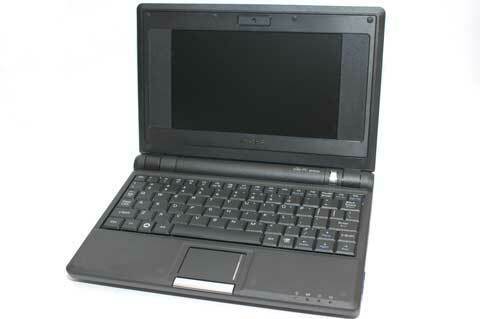 The ASUS Eee can only be described as a tiny laptop that is about the size and weight of a large paperback book. 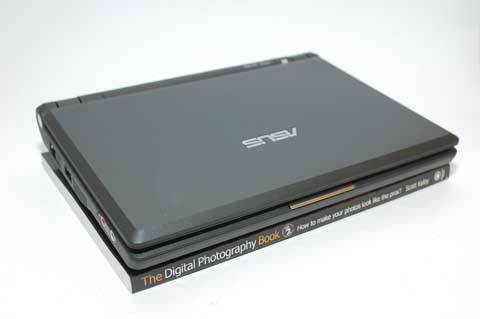 In fact, it is the same length and width as “The Digital Photography Book ” by Scott Kelby and slightly thicker. In more definite terms, it measures 22.5 x 16.4 x 3.5 cm (or 8.86 x 6.46 x 1.4 inches) and weighs 0.99 kg / 2.0 lbs. Cosmetically, it comes in a few colours including white, black, pink, green and light blue, but overall build quality is excellent and it feels very solid. The standard model is equipped with 512 Megabytes of RAM, an Intel Celeron 900 MHz processor, 4Gb of solid state disk and a 0.3 megapixel webcam. There are a few variants, mainly with differing RAM, internal drive capacities and the absence of a webcam. The specs may seem a little light on, but this device has been designed with portability and battery life in mind. With no spinning hard disk to contend with, data can be accessed quickly and it shows – applications load and function snappily. Most impressive is the ability to boot from a cold start into the OS in around 27 seconds, and shut down completely in 7 seconds. This means that it is extremely convenient to pull out the device say on a train or plane, and start working with a minimum of fuss. To further cut down on size and weight, the designers have done away with the optical drive, so you’ll need to connect an external one via USB if you’re thinking of installing applications off a CD. Not that you will be installing a great deal – the base Xandros Linux operating system takes up most of the room, leaving only 1.2 Gb to play with. The good news is that it has a SD card reader in which you can add additional memory cards, plus 3 x USB 2.0 ports to add external flash, optical or hard drives or USB gizmos. Connectivity-wise, it doesn’t have built in Bluetooth, but the built in Ethernet and wireless connections connect easily and internet surfing is a breeze. Having shown the unit to friends and family, one of the first things they will point out is how tiny the screen is. At 7 inches, the 800 x 480 pixel LCD screen provides a sharp, bright and vibrant image, but it means that one might have to get accustomed to doing a bit of scrolling when dealing with certain applications. Fonts are also smaller than usual, depending on what you are accustomed to using. The next point of contention is usually about the keyboard. Sized at 70% of the normal size, it is certainly touch type-able, but will need some getting used to. The layout of some keys, especially the right shift key the keys can bring a bit of frustration, but overall, the keys have a nice tactile feel and travel to them. The touch-pad and single right/left button is on the small side as well, but is functional. 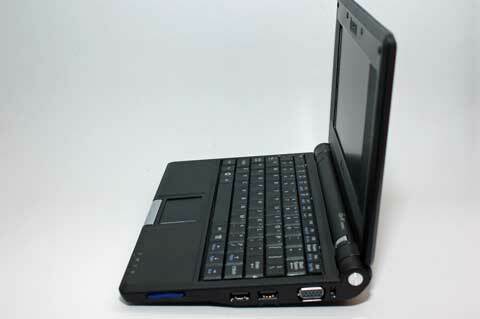 Finally, the Eee PC is equipped with a 5200 mAh battery (4800 mAh on some of the lower end models) which translates to around 2.5 hours to 3.5 hours run time, depending on your usage. This is average by laptop standards, and I was able to finish a DIVX version of the Ratatouille movie on a single charge. At the time of writing, the ASUS Eee PC comes with Xandros Linux by default, which is wrapped in a theme that takes an uncanny resemblance to Windows XP. A version with Windows XP pre-installed is in the works, but for the time being, ASUS provide XP drivers on a CD if you want to do it yourself. 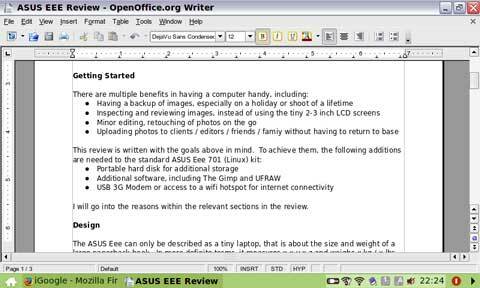 The philosophy behind the Eee is ease of use, and this shows through clearly – the default “desktop” is a tab based menu filled with large, friendly icons to launch applications. Things work pretty much the way Windows users are accustomed to – there is a File Explorer to view and manage files, and right clicking on files results in a menu with similar “open with…” actions. When plugged in, memory cards and external drive are auto-detected and an action chooser dialog pops up. FN key combinations control functions such as screen brightness, volume, toggling wireless on and off, and these pop up appropriate On-Screen-Display icons when activated. More functionality carried over from the Windows world is Alt-tab switching, the taskbar and also a system tray with icons for wireless connections, volume, battery and date/time. Even the bundled applications are strangely familiar – OpenOffice Writer, Calc and Impress look and function pretty much the way Microsoft Word, Excel and PowerPoint do. 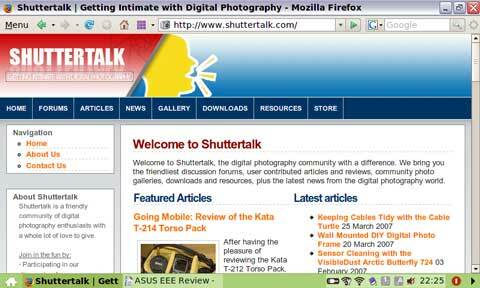 Mozilla Firefox for internet browsing looks and works the same way as it does on the Mac or Windows, as do messaging applications such as Skype, Thunderbird and Pidgin. Overall, I think ASUS have done a great job here and I don’t think an average user would be overly lost with the bundled applications. Things start getting interesting though when one wants to extend the functionality of the Eee. Installing additional applications for instance, require actions which some would consider advanced – like enabling additional software repositories through editing configuration files and accessing the hidden console mode. Thankfully, there are tools such as TweakEEE and PimpMyEee to make this process easier. Once you are familiar with this process though, countless applications are available and installable over the internet through the open source Linux / Xandros repositories. 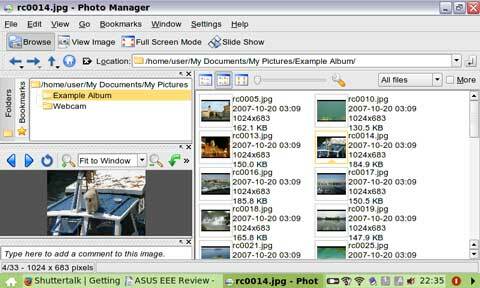 The former is the well known image management software from Google that has a very pleasant and nimble browsing interface, and supports things such as tagging and quick non-destructive image edits. The GIMP is an open source image editing program in the same vein as Photoshop, though some would say not quite as powerful or intuitive. 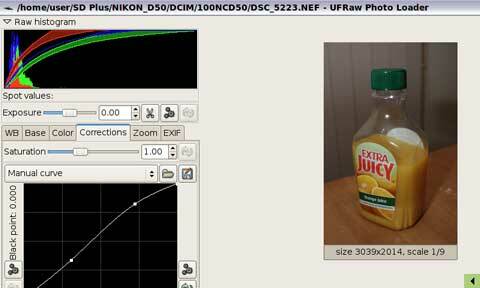 Finally, the UFRAW or DCRAW plugin is a requisite if you are shooting in RAW formats and want to import them into The GIMP. It was interesting to note though that copying from the internal disk to the external hard drive was much quicker than from the internal SD card reader to internal disk. This would suggest that the built in SD card reader is not as quick as it could be; perhaps it is connected via a USB 1.0 or 1.1 connection. The 4G model has only 1.3Gb of free space though. With this in mind, there’s really not much photos you can transfer from your card to work with. 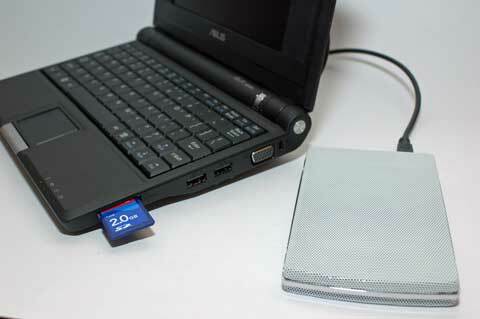 To make this solution usable, an external hard drive is really needed. Viewing images on the Eee PC is great, and certainly better than squinting at the 2-3 inch LCDs on the back of your camera. 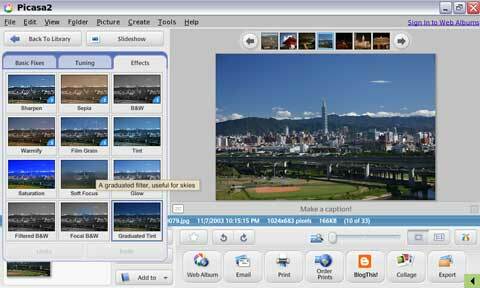 The images load and browse quickly due to the use of solid state disk, and organizing images both in Gwenview and Picasa are straightforward. Image editing is where it starts to get tricky though. These days 800 x 480 pixels of resolution is hardly sufficient, and it shows. The two floating tool panels of The GIMP take up almost all of the screen real estate, and the image window has to be moved on top of the tool panels to be used. In the UFRAW plugin, certain elements of the page (such as the action buttons) do not fit on-screen and the window has to be dragged around to view them. 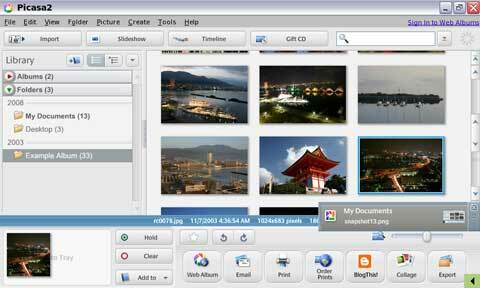 In Picasa’s edit mode even, the “image tray” is obscured by the actions panel on the left. If you can get past these challenges, then a full gamut of capable editing tools are at your fingertips. 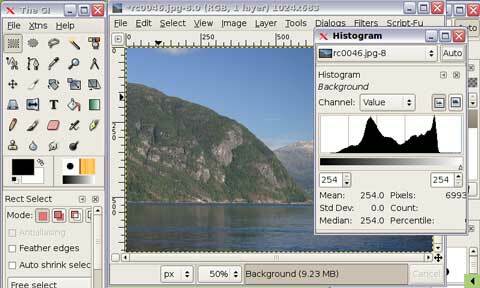 The GIMP is equipped with a full range of filters, tools and helpers such as histograms, colour adjustments and selection tools. 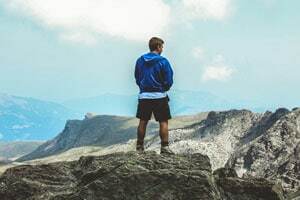 It’s not impossible to perform your full image editing workflow on the Eee PC, but for reasons I personally would struggle in doing so more than on an occasional basis. While there are a lot of things going for it, I feel that there are some things which hold this device back from being the ultimate photographer’s tool. The first and most obvious is the screen – 7 inches is great for browsing the internet and working on documents, but is definitely not sufficient for image editing needs. If you’re willing to carry around additional equipment, then it would make a practical solution for storing and viewing your images on the go. Additionally, the Xandros Linux operating system that is installed by default might present a hurdle to newcomers, to use familiar tools such as Photoshop, one would have to source a Windows XP version or install it themselves. Some, if not most of these issues are addressed by ASUS in their upcoming models – if they are a concern, I would suggest waiting for those to see if they better cater to your requirements. That said though, it is still amazing that Asus have managed to pack the functionality into a compact unit at this price point. There are plenty of merits in the usability department, including a full fledged office suite and touch typeable keyboard that would be well suited towards writers, journalists or even bloggers. It is sturdy, looks great, and the size and weight also lends itself easily to inclusion as part of a one’s standard kit. If you are willing to accept the caveats mentioned above, the Asus Eee 701 can be a great asset indeed.